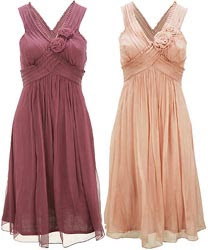 Looking for a dress that will please both the bride and the bridesmaid? Check out this lovely silk corsage dress from MaxStudio for $298. Perfect for a summer wedding, this 100% silk chiffon dress hits right below the knee. Don't leave your bridesmaid in tears over some ugly off the rack bridal store nightmare. This dress is a keeper and can be worn long after the wedding.